Russia has held a major military parade in the center of Moscow, an annual May 9 tradition to mark the German surrender in 1945 and the end of the Second World War in Europe. This follows French ceremonies on Wednesday. President Vladimir Putin was among the dignitaries at Thursday’s military parade, with Russia celebrating its most important secular public holiday to mark the 1945 surrender of Germany in the Second World War, just over a week after Adolf Hitler committed suicide. The annual Russian tradition was introduced by Soviet wartime leader Josef Stalin, but the ceremonies lulled somewhat in the 1990s under Russia’s liberal post-Communist leadership. Putin has expanded Russia’s Victory Day parades during his time as president and prime minister so that they now feature almost every element of the country’s land-based and airborne military, from fighter jets and bombers to heavy artillery, tanks and infantry parades. Putin also downed the customary 100 grams of vodka, the daily ration issued to Red Army soldiers during the war. Prime Minister Dmitry Medvedev, president during Putin’s one-term spell as prime minister, was also in attendance. The president last year announced plans to modernize Russia’s military, pledging some 23 trillion rubles ($740 billion, 560 billion euros) for the process. “We will do all we can to strengthen security on the planet,” the nationalist leader said. 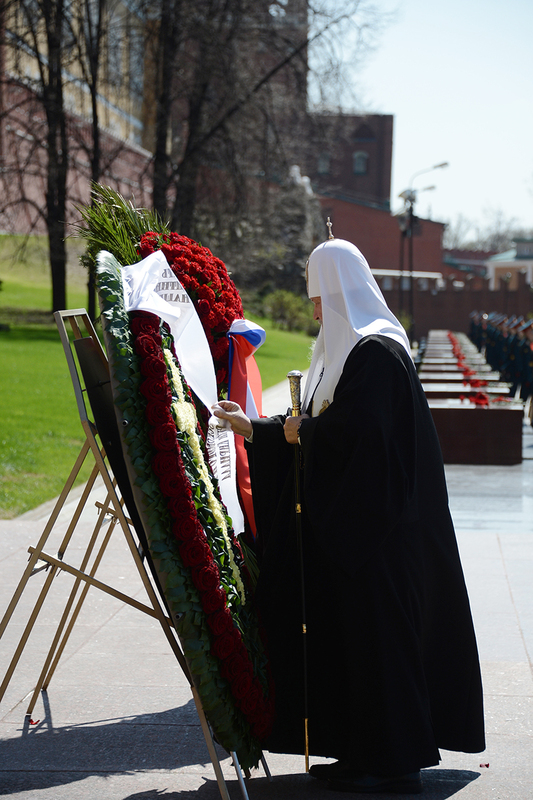 An estimated 27 million Russians died during the Second World War, the most of any country involved in the conflict, even though Russia only entered the fighting in 1941. In August 1939, shortly before the German invasion of Poland that started the international conflict, German and Russian Foreign Ministers Joachim von Ribbentrop and Vyacheslav Molotov signed a non-aggression pact. This treaty held until June 22, 1941, when Hitler launched Operation Barbarossa and broke the treaty, opening up an Eastern Front. Between this date and the US- and British-led D-Day invasion of 1944, when the other allied forces sought to regain a foothold in Europe, the vast majority of all military casualties occurred on the Eastern Front. The late-night signing of the formal German surrender in World War Two took place just after midnight by Moscow’s local time, meaning Russia traditionally marks victory day on May 9, unlike the May 8 date celebrated in the Central European Time zone. An implementation time of 23:01 CET was chosen specifically to span the two days across time zones. The preliminary German capitulation was submitted a day earlier in Reims in France, where only a comparatively junior Russian military leader was present. Stalin sought genuine Kremlin representation at what came to be known as the official surrender, when German Field Marshal Wilhelm Keitel submitted the capitulation to key Russian General Georgy Zhukov in the outskirts of Berlin. French President Francois Hollande and his Polish counterpart Bronislaw Komorowski attended a military parade and celebration in Paris on Thursday.